Oh, these pails are too COOL! And, yes... I sewed on it! LOL. The Love, Elsie paper is my new favorite. 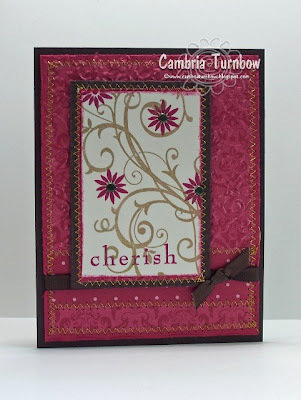 The rose colored center paper has flowers embossed on it... you can see from the photo, but click here to see it. That Betty line was made for ME! :) I love it all... I want it all!!! All the ribbon is Cindy ribbon from a batch Beate sent to me (thanks again sweet friend). You are so awesbomb to share your ribbon with me. (I'm happy you are home) This took me all week to make. I can only sit for short periods, but I loved how it turned out. Everyone is pitching in for my Grandma's birthday to get her some nice patio furniture... she will get a bucket full of money!! I can't wait to see the look on her face when she opens up the can. I have a matching card half made, but not done yet. Hopefully, I'll get that done Friday night. Tomorrow we head to the lake for the last preparations for the big party. My cousins will arrive late afternoon. The rain is suppose to stop by afternoon. I hope you all have a wonderful 4th of July weekend. My kids LOVE the 4th of July at the lake. The fireworks go over the lake, so there are a zillion boats floating in the water watching them. We try and get a spot right up front so it feels like they are going to fall on us. Everyone floats around.... some boats tie together and anchor. Each year someone plays the star spangled banner on a trumpet. It's dark... all you can see is all the boat lights. It's way cool. This year it's on Monday, so that people won't miss the fireworks in town on the 4th. I'm so happy all my cousins and their kids will get to share it with us and my Grandma. I have to tell you, that swap that I had to drop from, they surprised me today, when my mailman delivered a box of swaps! I just about cried I was so happy. FREAKin awesbomb friends I have. 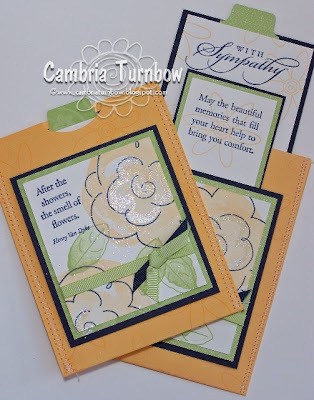 Stampers are THE most generous kind people on the earth... I'm serious. I get to feeling so down and frustrated when my back is constantly bothering me, then I am reminded how lucky I am and truly blessed. Thanks from my heart you sweet swappers!! I'm gonna make it up to you all. Okay... enough from me... need to get that banana bread baking. Thanks for stopping by!! Happy 4th of July (a little early). Ahhhhhh.... my friends. 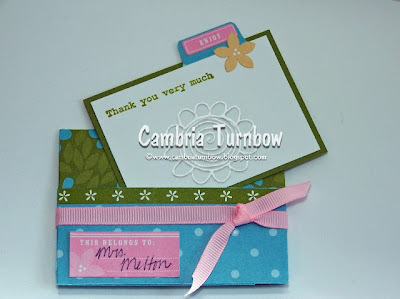 I went to a stampin retreat last September (hard to believe it's been almost a year). I had THE time of my life. I got to meet so many friends that I had talked to and "hung" out with over the internet.... friends I've made through this addiction ... uh um, hobby of mine. While there, my supah star talented friend Zapstar (Lisa Zappa), taught us how to cover frames with paper. She is DA queen of frames. You should see what that girl does with a cheapy dollar store frame. Click on her name to check out her AWESBOMB blog. That girl gives shabby a whole new tude baby. LOVE ya Zapstar!!! These are my two friends Lana Lepinski and Heather McNally. Most of you probably recognize Lana from SCS. Oh, man, it was a joy to finally meet her in real life. I cried when I got my first hug..... I was SO happy to finally meet her. These two girls make my heart smile! Heather, is SO funny... she can make me smile on the hardest of days. They are both amazing, truly amazing women, and I'm blessed to have them in my life. I got this little (photo is 2.5 x 3.5) frame from Walmart... it was just a plain wood frame. 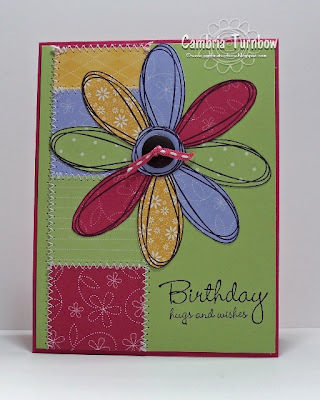 I covered it with this wonderful paper by Chatterbox called Sky Garden Floral. I LOVE it. Love the whole Garden line of paper. 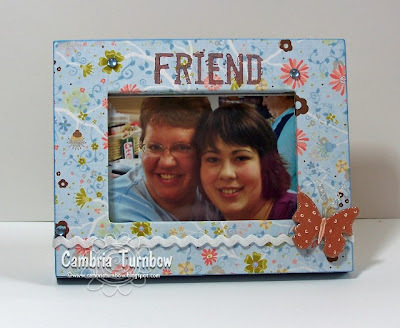 Emily Giovanni wrote a great tutorial on SCS for covering frames. Click here to see it. I used my craft bliss blue ink pad on the edges of the frame... it took a long time to dry which I could have sped up with my embossing gun, but it took me a couple days to get back to it anyway. 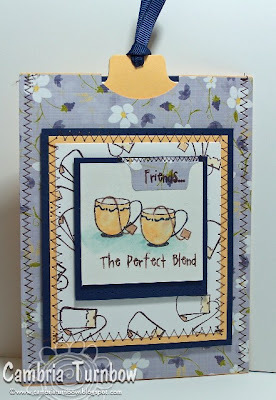 I stamped the top with the friend portion from the stamp set That's Nice in the Spring Mini with Close to Cocoa Craft ink. The ribbon is from Cindy of course. 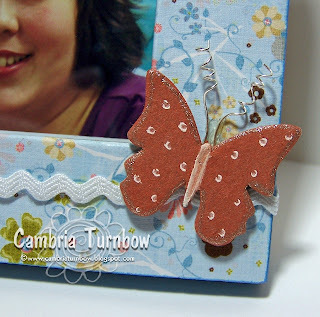 The little butterfly is from the Maya Chipboard Collection... they come in really cool tins! I rubbed the butterfly across my new Groovy Guava Ink pad and let it dry. I added some white with my Uniball White Gel Pen and some glitter with my Sakura Gelly Roll Glitter pen. I made the antennae by wrapping some Stampin'Up! Wire Works wire around the pointy thing in the Crafter's Tool Kit. Attached to the frame with a mini glue dot, then added Sticky strip to the back of the butterfly and placed it over the top. Lastly, added these cool little Jewels from Joy and Daisy's store eclectric Paperie to the center of three of the flowers. Okay.....I've got to get to bed early tonight, my eyes are crossing. I've got LOTS to do to get ready for all my family coming to celebrate my Grandma's 87th birthday. Hope you all have a wonderful weekend... I'm hoping for no rain!! My sweet little Averie is so excited to start school is September. I'm a little worried about her going since she'll only be five for two weeks, but I think she'll do fine... I think she's ready. Out of all her toys, the thing she likes to do most is draw and practice writing. 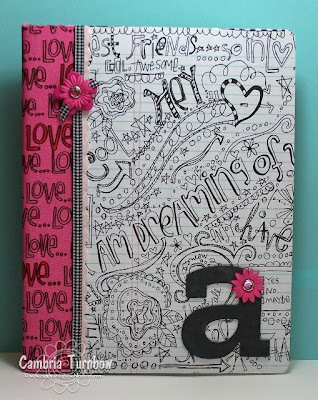 As soon as I saw this Love Elsie paper (Roxie Math Class), I KNEW I had to cover a composition notebook for her doodles. I'm sure it will even look better when she gets her hands on it and starts coloring in the drawings! I have to tell you....,that paper down the side, it is FABRIC! I just about died when it came. And, it's pink! Don't you think it's just calling to be sewed on though? I think it's calling to me. *giggle* It gives her notebook the perfect extra touch. You can see it here. I'm addicted to that Love Elsie paper..... CUTE STUFF!!! I got the paper daisies from Joy and Daisy too. 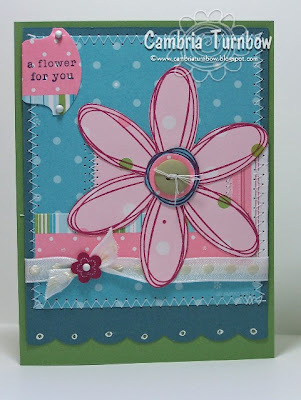 The top one is actually attached to a Maya Road chipboard flower that I mushed in pink passion craft ink. I ran a Stampin'Up Rhinestone brad in the center to attach them. 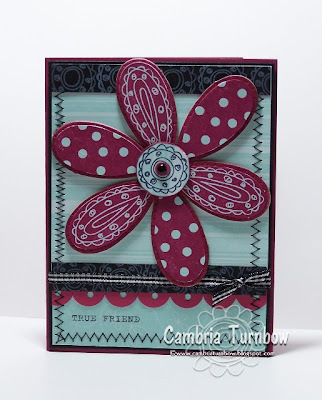 The big letter A is from Stampin'Up, mushed in basic black craft ink. Ribbon is from the wonderful Miss Cindy at Starlitstudios. I used both pink ric rack and black gingham on the side. 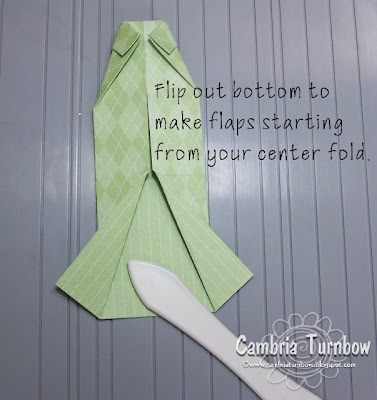 Super easy project. 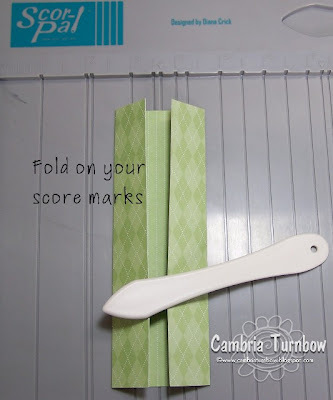 Just measure your composition notebook, attach the paper (I used Stampin'Up's snail adhesive), then add your goodies. I used Stampin'Up's Sticky Strip to attach the pink ribbon and the letter A. I can't wait to see the look on little Miss A's face when she sees her new doodle notebook! 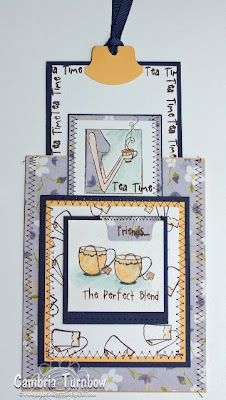 I'm playing with my new stuff from eclectic Paperie. I got some beautiful Chatterbox paper and that set from My Favorite Things, Hot Stuff. I LOVE that stamp set! I'm totally addicted to those double slider cards. They are super easy and so much fun. 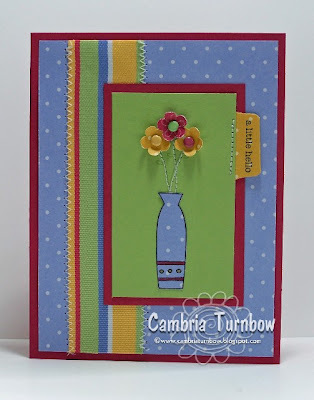 If you haven't checked out the tutorial on SCS by Beate, you should it's super easy to follow. She is the best at writing tutorials!! You can see it by clicking here. Hope everyone has a super day!! I have a ton of grocery shopping and baking to do today. My cousins arrive on Friday.... I'm SO excited to see everyone!! Two of my favorite things... coffee and friends. I got a few things from my friends over at eclectic Paperie. LOVE that place. I wanted this set the minute my peeps landed on it. I'm so happy eP is carrying some My Favorite Things stamp sets!! This set is called Hot Stuff, and I can't wait to play with it some more! I just had a minute, so I grabbed some of the kraft I had already stamped up for a swap and my sewing machine (cuz I can sew) and colored her dress with my aquapainter and craft white. Hopefully, I'll have some more time soon to play some more!! Other: Janome Sew Mini, Vintage Brads, Aquapainter, Cutter kit. Hope you all have a super day!!! Thanks for stopping by! 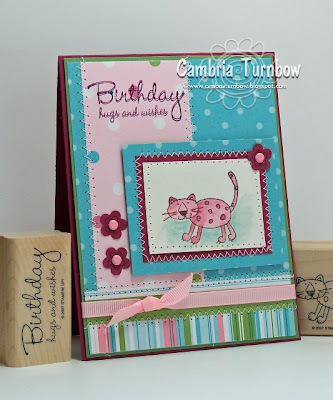 There is a great tutorial on SCS by Beate for this cool card. Click here to see it. It's called the double slider, and it's FUN. My club girls had a lot of fun making it. Other: Round Tab Punch, 3/4 Circle punch, Word Window Punch, Dimensionals, DD Glitter, Two-way Glue Pen, Grosgrain Ribbon, Janome Sew Mini Sewing Machine. 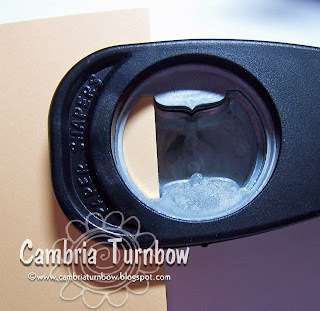 If you put the card stock this far into the punch and punch, it will make a nice little notch in the top so that you have room to grab the little tab. Hope you all had a great weekend. This Saturday is my Grandma's 87th birthday. We are having a HUGE birthday for her at the lake with tons of family and friends. I'm looking forward to seeing lots of cousins. Last week, my grandma got the green light to drive again since her surgery. She was So happy. She was off playing cribbage with her friends and driving herself to therapy. I'm so lucky to have her in my life. Thanks again to everyone who sent her cards during her recovery. You guys are THE best! I'll try and stamp a bit this week, but I have a lot of shopping, and cooking and getting ready for the big event. My back is much better, but I still can't sit for long. Thanks again for all the well wishes. Okay.... so I only sat down for a minute, and I had the background already done. All I had to do was stamp out the flower because I had 37 vases already cut too. My Aunt had her hip replaced again yesterday. She was in SO much pain, it broke my heart. I had to get a card in the mail for her, since today is also her birthday (I already sent her birthday wishes). My back is feeling a bit better, but I'm going to remain off the computer and from sitting and hope that next week, I'll be back to stampin full force. Thanks so much for all the well wishes... you are all so sweet to me. THANK YOU!!! If you can send out some positive vibes or prayers to my Aunt Roseanne (sumtoy on SCS), it would be appreciated! I can't ever pull out my Kraft card stock without thinking of my friend Heather (Pinefeather on SCS). 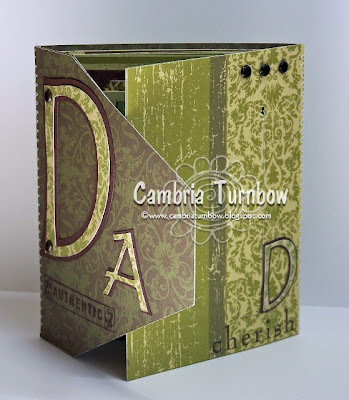 She does AMAZING things with Kraft card stock. This WAS my swap card, and I have 37 cut out and ready to go, but my back isn't cooperating and I had to drop... I've never dropped from a swap... I feel so bad. 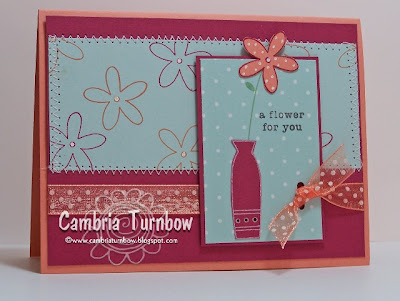 So, I guess you'll be seeing lots of cards made with the flowers on the kraft card stock... LOL. I'll post the recipe later, I thought I'd feel much better today, since I got to sleep in until 10:00. My parents took the twins to the lake and it was quiet this morning... but as soon as I sit.. DANG IT. This is my swap dud. I was in a swap, and wouldn't ya know it, I can't stamp! I liked the colors, but something with it just didn't do it for me. Maybe it's the big flower at the bottom? I finally got my swap ready, and cut and then my back gave out and I'm miserable. I'll post my swap card later, but I'm going to be taking a little break from the computer and stampin. I just can't sit for long and it's FRUSTRATING. Please forgive me if I don't respond to emails right away.... hopefully a few days of non-sitting will help me out. Thanks so much!! So many of you have asked about my sewing machine, so here it is on sale! Oh man.... I'm THE worst at last minute stuff. Good thing my husband had to work today.. not that it was good he had to work, but good that I had more time to put something together for him. We had a nice dinner yesterday at the lake with my parents and family for Father's Day, but my husband needs something special so that he knows how much we appreciate and love him. He really is "DA BOMB" of Dads... just ask the kids, they still think he's cool! 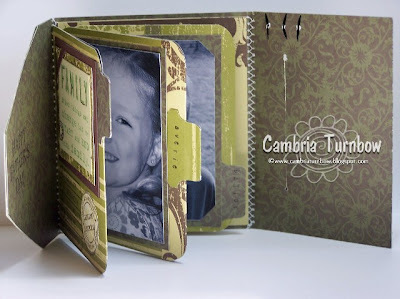 This whole little card/album is made with the new designer paper out of the Fall Pre-view brochure from Stampin'Up! I used some Chocolate Chip and River Rock card stock to layer, but the rest is all the DS Paper. 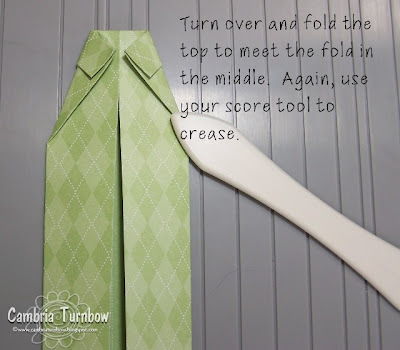 You can find the instructions at Maria's blog... it's amazing. It's her ATC Accordion Holder Tutorial. I just glued the inside pieces together and added photos instead of ATC. She has lots of different versions. Thanks Maria!!! AWESBOMB tutorial!!! shazam.... and not just because I CAN sew! *giggle*. Okay... I did it just because I have to sew on everything because I can. LOL I'm busted. I can't believe I almost didn't order the paper..... I LOVE this paper. 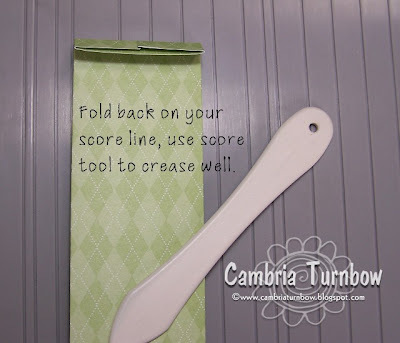 Other: Round Tab Punch, Vintage Brads, Cricut, Janome Sew Mini Sewing Machine. I hope you all had a wonderful Father's Day weekend. The weekends go by way too fast don't they? Happy Father's Day to you Dads out there!!! 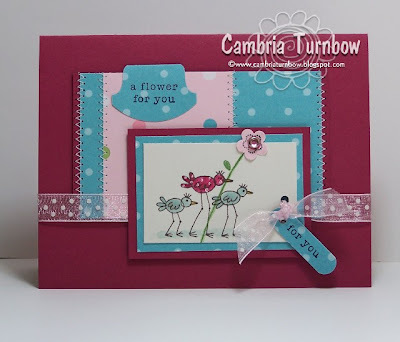 I saw a card by Shelly Deans and she had the big bird carrying a flower.... how clever! I have that big flower from the upcoming new hostess set Vases in Vogue, so I decided to give it a try. :) I had more scrap pieces so I used my little sewing machine and SEWED ( I know you are rolling your eyes, but it's okay, I'm still thrilled with myself). I used the new punch from the Three For You Punch Box for the little flower with a pink rhinestone brad (available soon in the new catalog). Sediment is also from the Vases in Vogue set. Ribbon is Cindy ribbon. Little tag is made with the Word Window Punch. Other: Aquapainter, Rhinestone Brads, Round Tab Punch, WW Punch, Slot Punch, Cindy Ribbon, Dimensionals, Janome Sew Mini. Hope you all have a great weekend. Thanks for stopping by to say hi!!! Oh man... they have some VERY cool sketches. I'm going to be a regular visitor for sure! I'm stitching, stitching, stitching... I can't stop. I love my sewing machine. 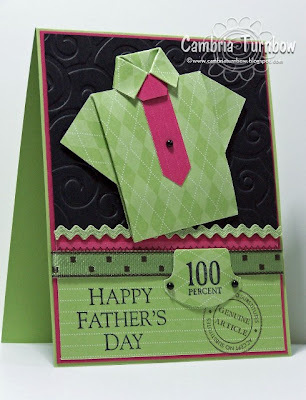 Again, if you want a great tutorial about sewing on cards, click on the Belle Papier link on the bloggin babes menu to the right. Julia does an awesome job and I feel like I can sew because of her gentle push and inspiration! Those little mini brads are from Queen & Co. (a gift from my friend Heather). Ribbon is Cindy Ribbon (Starlitsudios), a gift from Beate. My friends are TOO good to me! Thanks girls. 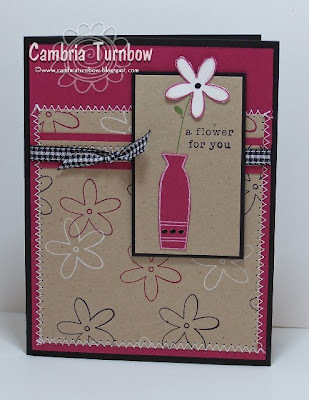 Everything else is Stampin'Up! Other: Janome Sew Mini Machine, Thread, Soft Subtle Buttons, Hold Punch, 1/2 Circle Punch, Round Tab Punch, Cindy Ribbon, Mini Glue Dots, Mini White Brads, Slot Punch. Have a super everyone.... and don't forget to go over and check out Sketch This: Cards!! Image was colored in with my aquapainter. If you squeeze your ink pad before you open it, you will get ink on the inside lid... you can use it to paint from. 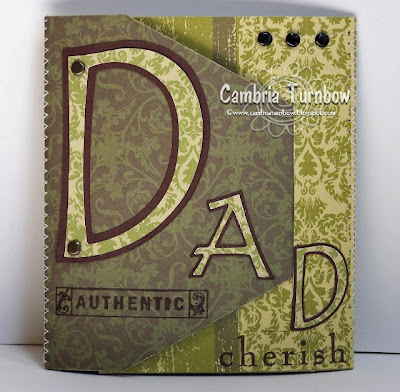 :) Shimmery white is my all time favorite card stock and perfect for when you are watercoloring. Other: Sewing Machine, Pink Grosgrain, Soft Subtles Brads, Crafter's Tool Kit, Stamp-a-ma-jig (to get the double colors on the birthday hugs and kisses), Aquapainter. Remember those little gift card holders? I sent them to school today with the boys for their teachers.... nothing like the last minute. I've KNOWN forever that today is the last day of school, but do you think I could get it done BEFORE? Story of my life. Anyway, I got these cute little bags at Walmart. I made some fronts with card stock and the Petals & Paisley Designer Series Paper (sewed together, because I CAN SEW! ), and adhered them to the front and the back. 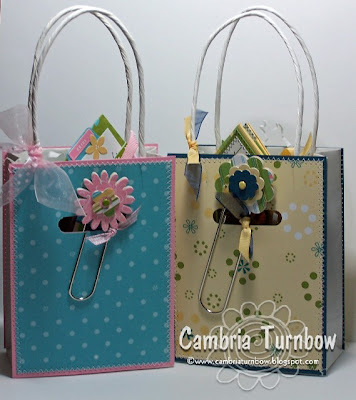 Then, used the Word Window punch to punch a slot all the way through the bag to hold the book mark. Added some ribbon to the handle and some chocolate to the inside and DONE. I know I could have made them MORE cute with more stamping or decorations on the front, but I just didn't have the time. I still think they turned out okay and the boys were thrilled to take them to their teachers this morning. Sorry about the photo... it was dark this morning. I was waiting for the clippies to try overnight. I can't believe another school year is over. Next year, my oldest will go to HIGH SCHOOL, my twins will head to the middle school for fifth grade and Averie will go to Kindergarten for half a day... every day! WOW..... they grow up WAY too fast don't they? I'm in a small tri-fold swap and wouldn't ya know it, I have to stamp for something and NOTHING comes to me. I really love the new designer paper and the colors soft sky and purely pomegranate, so I started there. 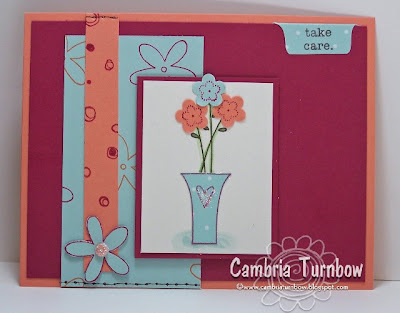 I used the new punch box Three For You and punched the flowers at an angle, through all three layers of paper so when it's adhered on the base it's shows through. The very back layer has the flower outline stamped on the inside of the flowers (which you can't see very well from the photo) and I also added a tiny dot of white with the white gel pen. The stems are made with the pokey thing in the crafter's tool kit... something Val from Cal got me hooked on. I used aquapainters to color in the snake with wild wasabi (my aunts all time favorite color so far) and added some shading with blue bayou. Hope you all have a wonderful day... we celebrated our 19th wedding anniversary yesterday. I can't believe it's been 19 years! I love my man. :) He's such a bomb. I know, it's funky baby, but I like it. And, yes.... I sewed. I found some black thread! Have I told you that I can sew........ *giggle*. Oh, yah, I'm still totally thrilled with myself. I'm sure I'll get over it soon, but you'll have to bear with me. I LOVE LOVE LOVE that the new chipboard matches this set! How cool is that? And, I LOVE that the chipboard changes color so easily. I just rubbed the petals across my pomegranate pad and shazam, it was perfect. The petals are stamped on to soft sky card stock with purely pomegranate classic ink, then cut out and glued onto the chipboard. The background is the new Soft Sky Prints Designer Series Paper. LOVE it! Wouldn't this big ole flower be perfect on scrap pages? I might just have to give it a try! Other: Black Gingham, Sewing Machine, Slit Punch, Hole Punch, Dimensionals, On Board Blossoms & Basics, Vintage Brads, Circle Punch. Hope you are all having a super weekend!! I wasn't going to order the paper.... I was just going to be good and get stamp sets..... RIGHT. LOL. I plan on being so good, then when I get to OEX, I just lose it. I'm happy I got the paper, it really is VERY pretty. This is one of the funnest parts of being a Stampin'Up! demonstrator... PRE ORDERS baby!! Oh... I'm LOVING the new colors!! I think I will use them much more than I did this year's In Colors. Yes... I'm still sewing! I LOVE my new machine and I have to say, I'm THRILLED with myself that I'm sewing. I need some practice on keeping my lines straight, but it will come right? At least I don't have big thread balls. And, I haven't had the urge to toss it out the window ONCE! Other: Janome Sew Mini Machine (I sewed! 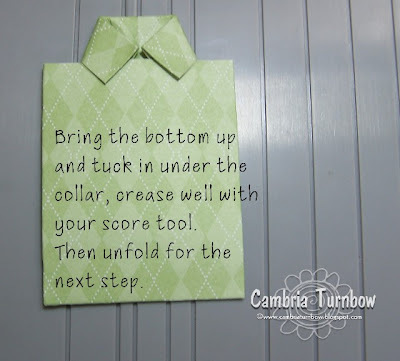 ), Stitched ribbon, Ice Square Rhinestones, Dimensionals, Crafter's Tool Kit. Hope you are all having a good day... I'm gonna sew some more! LOL. I have to tell you, I cannot sew. I BARELY passed home ec in high school. My sister... she could sit down and whip out stuff without patterns. I just wanted to throw the machine out the window. Last year in WI, my friend Pinie tried to teach us (everyone else did fine) how to piece together paper with a sewing machine, but I just ended up with balls of thread. They say that one of the machines wasn't working right, but I swear it was me and my sewing curse. Pinie was just trying to be nice I think. I gave up and moved on to the kitchen to help with dishes. LOL. Some gals on SUDSOL were talking about machines and someone (Gina?) suggested the Janome Petite. I found the Janome Sew Mini on Ebay and got a good deal.... considering I can't sew. It's under five pounds and small, but was suppose to work just like a real machine. 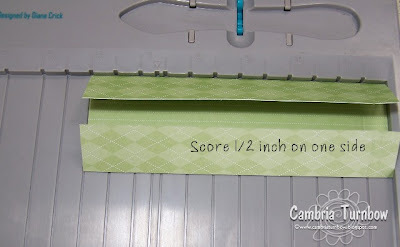 I saw this AWESOME tutorial about sewing on cards over at Belle Papier . Julia is AMAZING... don't look at her sewn cards before mine... LOL. LOVE all her work.... totally AWESBOMB! Girl can stamp AND sew!! 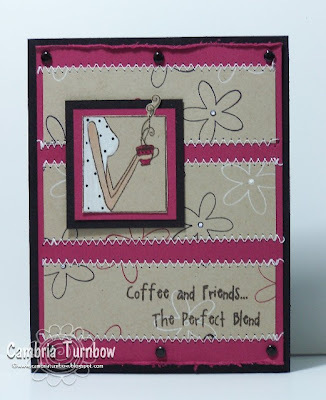 So, my machine came, I re-read the tutorial by Julia and I decided to give it a whirl while waiting for my Stampin'Up! preview brochure order. Oh My Gosh!! I'm SO thrilled with this little machine. It has the little petal to step on ( do they all?) LOL, and it doesn't go too fast... maybe that is my problem with big machines. So, for a sewing tard, I'm pretty darn proud of myself and can't wait to show my Mom.. she is NOT going to believe I sewed! I still need some practice, but I'm sewing, I'm sewing!!!!! This is the piece that was cut off from the sewn piece in the card below. I have a ton of scraps from the Palette O' Prints pad, so I stamped the petal on them, and cut them out. Added a button from the neutrals button collection and a piece of ribbon from the Sweet Shop Ribbon Originals Collection. 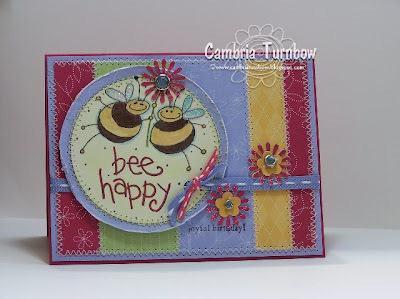 These adorable bees were sent to me by Beate.... because I was admiring her wonderful bee cards that she made with her stamps from Eclectic Paperie. She was a sweetie and sent me some. Thanks Beate! I was trying to be patient and wait for my SU! box with my new goodies and right before I finished my card, my box arrived!! I quickly ripped into it and tore into my new Rhinestone Brads! They come in three sizes, and I couldn't decide, so I just used one of each. I even sewed around the circle! Can you believe it? I'm sewing, I'm sewing!! 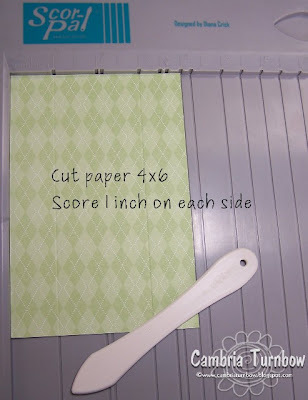 Pinie showed us to get a piece of card stock and add just a tiny bit of adhesive to your strips of designer paper... don't worry about them all being the same length. Then, sew on all the seams, later you can cut them in the sizes you want. She made it look SO easy. SNORT. Today, it actually was... I'm so happy! Thanks my sweet friend! It might have taken me a year, but I did it!! I'm sewing!!! Come to find out, it wasn't just Jayce who had Strep throat. I hadn't been feeling great for about a week, but didn't have a sore throat. Jayce, Averie and I tested positive for Strep. The first time I've EVER had it, but I guess it just gave me headaches, stomach aches and just plain made me miserable. So, the whole family is on antibiotics.... hopefully we'll kick this bug. I guess that's what we get for never having it before..... it's making up for years of being strep free. Okay.. my box is here!! I'm SO excited to play with my new stuff! Have to get dinner for the gang first, but tonight, I'm cutting more rubbah baby!!! Hope you all had a super day!! Thanks for stopping by! Are you sick of me yet? I just had one more version to share. I love this little holder. 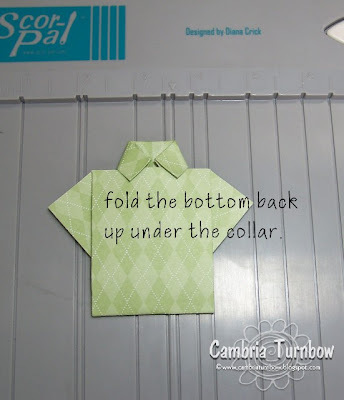 On this one, I inserted a little pull out to the front pocket where I will write a note to Jayce's teacher, or better yet, I'll let him write on it. I left the ribbon a little long, so that it can be tied and retied. It actually keeps the little gift card holder closed. You can see the inside and the tutorial here. 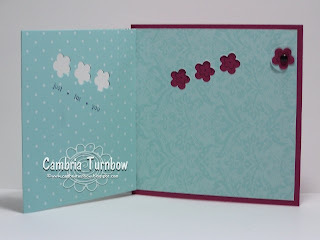 I absolutely LOVE the Round Tab Punch from Stampin'Up! 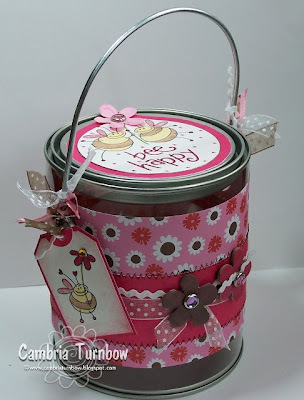 's Spring Mini and the Little Reminders Accents and Elements Tin, it makes these projects quick and easy, which is all I have time for these days. 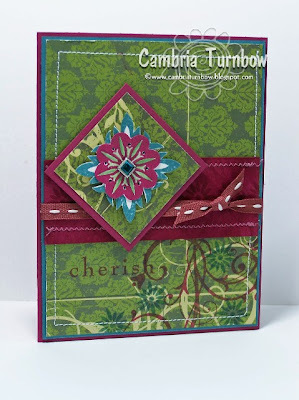 :) The paper is the Petals & Paisley's Double Sided Designer Paper, also from the Spring Mini. Here is a view from the back. 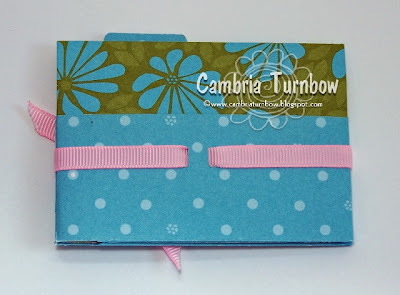 I used the double rectangle punch to make a slot in the fold so that it holds the ribbon in place. Hope you all had a great weekend. I'm trying to catch up on laundry today...story of my life. Thanks for visiting! See ya later!